It may seem improbable but there is absolutely no doubt that Marybell is the boss in this house! She runs rings around Libby and me but is so funny and full of herself accepting ever favour and forgiveness on our part, as nothing more than she deserves. 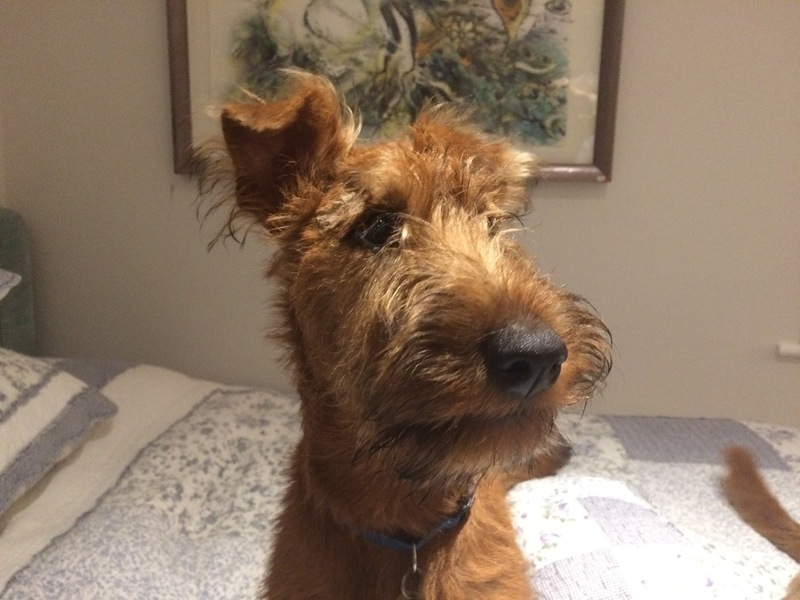 She is a very different character from Liberty Belle – much more determined and terrier-like. She reminds the whole family of our beloved Miss Bunch who was a brilliant athlete, could run like the wind and catch a ball at full tilt. Libbs has a very soft mouth and in any case tends to overrun her target. Bunch would leap over the park benches over and back and over and back just for the fun of it whilst Libbs likes to perch for a moment. She also likes to run in a straight line and already finds Marybell’s antics of ducking and swerving not quite Queensbury rules. To both our horror Miss M loves water and splashed about in their water bowl from day one. Libby loves her dearly and is so incredibly kind putting up with hours of baby wrestling. She keeps an eye out for her on the marshes and dashes off to ‘find Marybell’ if she disappears for a moment in the long grass. I think one tends to forget the sheer impact of a puppy on a household. Admittedly it does not last for many months and they do grow remarkably quickly. Marybell seems to have tripled her size in a matter of 12 weeks. She is so at home that I feel that she must have been here before or even forever but there is no escaping the bouts of chaos and the fact that I am less tidy, even less organised and less punctual can not be denied. The joy however of non-stop entertainment, the laughs and the exasperation and the desperate love they all demand are old recognisable well rehearsed patterns. I submit willingly to yet another era of undying devotion – well who could be so lucky? Interestingly I am a bit more anxious about Marybell – the possibility of ‘accidents’ seems to occupy my mind in a way I don’t recall. She even has a little blue harness in case she should slip her collar – now I have never done that before. Every door has a stop in case it should bang shut and injure her, conkers are hidden in case she should choke on them, the list is endless. It’s hard not to become an old fusspot seeing disaster around every corner but I am taking myself in hand. We have managed to keep all our summer dates even if, as I said, we arrive late and dishevelled. How is it too that the days seem so much shorter and small tasks take longer fending off a disruptive pup. But I do love the continuum of happy activity – the forbidden speed chases through the house – the cushions hurled off the sofa – the perpetual hunts for lost property – the leap on to the tea table and the cheers over each new trick – yes she caught a flying biscuit this morning, swallowed it whole by mistake and then hunted for it everywhere. There is nothing like a good laugh for putting life into a cheerful perspective. My dear friend Brenda has been so kind to have the whole portable menagerie which includes the canaries land on her in London. We have met up with old friends in Regents Park and Springfield Road and it does seem strange to have a dog who has never lived there – not that it worries Miss M who sees no difficulties and is on kissing terms with everyone. We made it to the fun day at Roade. I had bought a large plump sheep as a prop for Libby’s costume as Little Bo Peep. We got as far as the pale blue bonnet, but Libbs, unlike Beegie who loved dressing up protested tossing her head about and flattening the hat. It was never going to be a success and I gave up. Miss Marybell and I were audacious enough to enter the Puppy Parade but we pitched too late for anything more than a brief twirl in the ring. But the very kind judge gave her a pink and white rosette saying SPECIAL which I am sure Miss M found gratifying. It’s always a very happy day but I do miss my Beegie who was so ‘into’ the games and races. She never lost a sausage race, more probably through natural greed than skill. She simply swallowed the sausages whole and ran back for more. Libby refuses to be hurried and chomps away very slowly. We will have to try Marybell next year. I feel that she is bold and bright enough to become an expert. 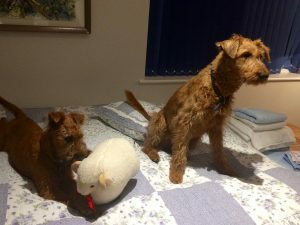 We managed to find our way to the SITS show at Steventon having missed it last year as we were caught in a dreadful holdup on the A34 – awful road. Alan and Lyn Summers were there and it was so touching to see how absolutely thrilled Marybell was to find them again. She squeaked and pranced and I do think she might have gone home with them quite happily. We are slightly exercised about her ears that sometimes stand up like a bat. She is teething which does tend to push the ears out of place. She is such a lovely puppy and I know that Ann would like to show her but crooked ears I’m afraid won’t do. We have had a happy time with some of our favourite cousins. 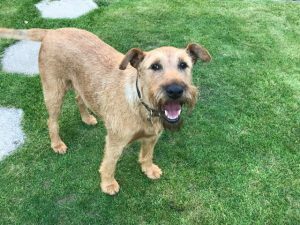 Libby has always had such fun with them – a house full of children is her best thing and with Insy their cross spaniel flatcoat as well – the mix is perfect. Marybell pitched in at once with all 4 feet and she did have a lot of fun and had some ‘real’ walks which she loved for the first time. We are lining up for Discover Dogs at the Excel Centre in London on 21st and 22nd of October to talk about our best beloveds. The gathering at the Animals in War Memorial is on Friday 10th November at 10.45am. It would be so good to see you with your Irish Terrier to add to the little posse of Micks. They cheer us up as some of the readings can bring a few tears. With many greetings and my love to the dogs.